He used to be a librarian. Old habits die hard. Very difficult to mulligen or draw this card. 80% of the time last 10 cards in the deck. This is probably the only good deck that makes use of this card. This card seems like it has pretty legitimate applications in Oil Rogue and Aggro/Mid-Range paladin decks, given (if you have them in hand) he's almost a guaranteed 6/6 d-shield with Blessing of King curving perfectly with him. He might be a little soo slow for Aggro-din as the charge variant will likely be the stronger candidate for addition to that deck, but still. this card on turn 3, then blessing of kings on turn 4 + trade with a 4 drop and get a free 6 6. This is the best possible situation for this card, honestly it doesn't seem THAT bad. But it's definately meant for a buff + trade. If you have the 2 card combo, it's crazy tempo and really good in arena, but you need that combo. Otherwise, mediocre card and too boring to build a deck around. But in all honesty, this card seems like a good alternative for Shade of Naxxramas, especially considering it's a common, it could also make some interesting combos with Fjola Lightbane and Blood Knight, and it could make buff decks more common. Hard to tell so early on, there could even be more cards that could work together with these, there are so many left to be revealed. I'm still waiting for the stealth charge combination. The purpose is they counteract each other. Not very bright are ya? I think the point of this card is that the only counter to stealth (before reveal) is board clear, and with divine shield, you would need TWO board clears to remove it, which is huge tempo gain. The other option is to leave it there, but that can be very costly in the right deck. Of course, it is a niche card, but that is what hearthstone (and any TCG) needs, not more OP cards that appear in all decks. I really honestly love this card. Ive been waiting for a Stealth and Divine Shield guy. His stats could be 2/3, but hes still good. Logic: Hit face-2 damage+2/2 divine on board. Logic: Kill minion-2/2 on board. Good Blessing of Kings target. Might run this in Paladin for the same reason Priest runs Gilblin Stalker. I was thinking the exact same thing. 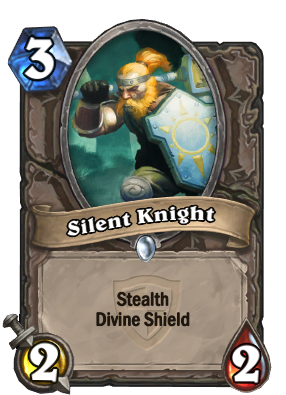 Also, just because it doesn't curve right for Velen's doesn't mean this guy might not get added to or replace Gilbin in a priest deck. ninja combo druid 2 shades, 2 silent knights popping out with savage roar. this card could be solid with any type of buff, great for popping down to prepare for an early buff, such as a next turn oil or a next turn kings or savage roar combo etc. an added bonus if they can't deal with his shield. quite a strong card when you think about using it this way, especially if it manages to live with buffs if divine shield can save it another turn. Feels like it's barely better than Gilblin Stalker. Sacrifice 1 health for divine shield, just like shielded minibot did. Doesn't seem very good, but I guess we'll see.